3mm Thick | 25cm x 25cm (625cm²). - 25cm x 25cm (surface area of 625cm²). - Easy to cut, allowing you to customise the size of the sheet of foam to fit your computer fans/enclosure. - 3mm thick; perfect thickness to guard your PC from internal dust build up, and to allow the fans to draw sufficient cool air to cool your system. Material: pvc material. Help to keep your PC and PC components clean, minimise the noise from the fan and extend the life-span of your fan. When the fan in your PC blowing cool air inside a computer case, it can also take in dust and dirt. The dustproof net is made of PVC plastic material, which is corrosion resistant and washable. Colour: Black. 1 x Dust Filter. Rinse with clean water, do not use corrosive cleaning. Help to keep your PC and PC components clean, minimise the noise from the fan and extend the life-span of your fan. Fits standard 140mm fans / Or can cut at your own risk. When the fan in your PC blowing cool air inside a computer case, it can also take in dust & dirt. Size: Fits over a 80mm fan case. Protects your internal components from dust and debris. Colour: Black. Simple and elegant appearance. 3mm Thick | 50cm x 50cm (2500cm²). - 50cm x 50cm (surface area of 2500cm²). - Easy to cut, allowing you to customise the size of the sheet of foam to fit your computer fans/enclosure. - 3mm thick; perfect thickness to guard your PC from internal dust build up, and to allow the fans to draw sufficient cool air to cool your system. Help to keep your PC and PC components clean, minimise the noise from the fan and extend the life-span of your fan. Parallel Pitch: 10.5cm (cm). When the fan in your PC blowing cool air inside a computer case, it can also take in dust and dirt. 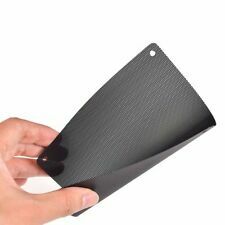 120mm Computer Fan Cooling Dustproof Dust Filter Case fr Aluminum Grill Guard !! Size Approx : 120mm x 120mm. span of your fan. minimize the noise from the fan and extend the life-. 12cm PC Case Fan. When the fan in your PC blowing cool air inside a. computer case, it can also take in dust and dirt. Size Approx : 120mm x 120mm. span of your fan. 12cm PC Case Fan. When the fan in your PC blowing cool air inside a. minimize the noise from the fan and extend the life-. computer case, it can also take in dust and dirt. The size of dust filter is 120 x 120 mm. The hole diameter is 1 mm; Fits for standard 120 mm or slightly smaller size fans; PVC material. The dustproof mesh has fine holes, can provide efficient dust reduction properties, protect your computer from overheating. Help to keep your PC and PC components clean, minimize the noise from the fan and extend the life-span of your fan. Suitable for home computer chassis fan dust, speaker, speaker grilles and a variety of electrical and electronic products speakers dust protection. Mesh Size 120x120mm(4.7''x4.7'') Material PVC Color Black Type Filter Brand Unbranded/Generic MPN OPO62876524621 EAN 0762876524621. Size Approx. : 140mm x 140mm. Counterfeit Banknotes Check Detector Fake Money Marker Tester Pen With UV light. 10 35mm Magnetic Stirrer Mixer Stir Bar PTFE Lab Spin Spinner Cylinder. CS Airsoft Paintball Goggles Tactical Glasses Face Eye Protection Mask UV400. Fits standard 120mm fans or cut for small size. Extend the life span of your fan. Great for use in PC case blow holes. 4pcs 60x60mm Computer Mesh Fan Cooler Dust Filter Dustproof Case Cover new. 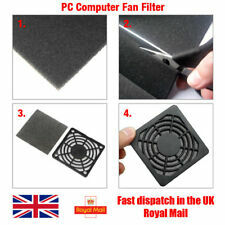 4 x Computer Case Fan Dustproof Dust Filter. Minimize the noise from the fan and extend the life- span of your fan. 14cm PC Case Fan. When the fan in your PC blowing cool air inside a computer case, it can also take in dust and dirt. Help to keep your PC and PC components clean. Extend the life span of your fan. Great for use in PC case blow holes. Keep your PC clean and dust free. Fits standard 120mm fans or cut for small size. Easy to cut, allowing you to customise the size of the sheet of foam to fit your computer fans/enclosure. 3mm Thick | 100cm x 100cm (10,000cm²). - 100cm x 100cm (surface area of 10,000cm²). - 3mm thick; perfect thickness to guard your PC from internal dust build up, and to allow the fans to draw sufficient cool air to cool your system. 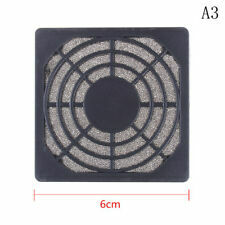 PC Computer Fan Dust Proof Filter Semi Open Cell Wave Effect Foam, Between 5mm - 1.4cm thick height (dips and peaks), 23cm x 14.5cm dimensions Ideal for computer fan filters Very breathable Ruler not included and for scale only. Material: pvc material. Role: installed in the fan inlet. Reduce dust and protect fans, prolong life. Size Approx. :140mm x 140mm. Useing for filtration, dustproof and fit forcomputer case and fans and others. minimize the noise from the fan and extend the life-span of your fan. 14cm PC Case Fan. When the fan in your PC blowing cool air inside acomputer case, it can also take in dust and dirt. Features: 1.Every product has a unique Manufacturing Part Number label on the inner package that proves it has been qualified,which include Part Number,Model Number and inspection date information; 2.If you have any questions about the item,please provide us the Manufacturing Part Number for checking,your profits will be guaranteed. 3.Can protect you computer from overheating 4.Help to keep your PC and PC components clean,minimize the noise from the fan and extend the life-span of your fan. 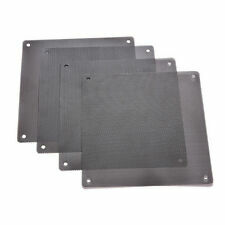 5.Used for dustproof of computer chassis fan, speaker net cover and various electronic product speakers. Specifications: Material: pvc Color:Black Brand name: Unbranded. 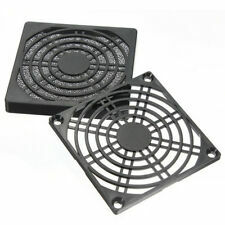 12x12cm PC Computer Fan Cooling Dustproof Dust Filter Case Wire Grill Guard. 1X Fan guard. A great accessory for your PC, computer. Mounting hole center to center distance: Approx. Wave-folded design, provides larger surface area for dust blocking. Size：140MM. Fits standard 140mm fans or cut for small size. Extend the life span of your fan. Great for use in PC case blow holes. Fits standard 140mm fans or cut for small size. Installed in the fan inlet,reduce dust and protect fans, prolong life. Help to keep your PC and PC components clean. The real color of the item may be slightly different from the pictures shown on website caused by many factors such as brightness of your monitor and light brightness. Length: 40mm/ 1.57in. Width: 40mm/ 1.57in. High toughness and elastic properties make you easy to removal and wash. Help to keep your PC and its components clean and protect your computer from overheating. 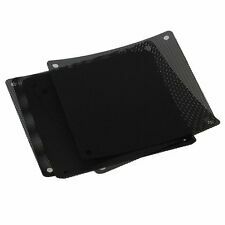 Black PC Computer Fan Guard Cooling Dustproof Dust Filter Case Wire Grill New. 1X Fan guard. Material: Iron wire. Mounting hole center to center distance: Approx. Wave-folded design, provides larger surface area for dust blocking. Product side length: 12cm 12cm(120mm 120mm). Role: installed in the fan inlet. Reduce dust and protect fans, prolong life. Extend the life span of your fan. - Keep your PC clean and dust free. - Great for use in PC case. I am sure it the right thing you need now. Suitable for 120mm x 120mm PC case fan. Protect your PC computer internal components with this 120mm fan case filter. Slides on the back of your computer and protects against harmful dust buildup. 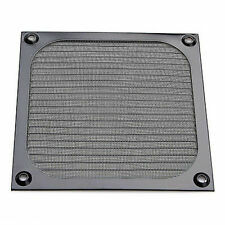 120mm PC case fan filter. Extend the life span of your fan. - Keep your PC clean and dust free. - Great for use in PC case. 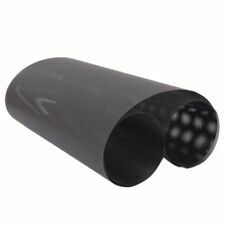 - Black Painted PVC Construction. - Size: 510x300x1mm. 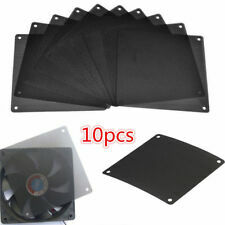 Brand New and Quality 12 PCS Cuttable PVC PC Fan Dust Filter Dustproof Case Computer Mesh 120mm Black Help to keep your PC and PC components clean, minimise the noise from the fan and extend the life-span of your fan. When the fan in your PC blowing cool air inside a computer case, it can also take in dust and dirt. Reduce dust and protect fans, prolong life.